Get my camera fixed (the screen has loads of broken pixels, which are bloody annoying), and get an underwater housing for it for when I’m diving. I’m sure there’s a million other things I need to do in the meantime, but that’ll do for starters. I’ve already made start in one area: I’ve finally got round to giving up smoking (again), and after taking the summer off I’m planning to startBoot Camp again, after enjoying a summer off. I plan to do a fair amount of hiking next year, and I want to make sure I’m properly fit again (and look good on the beach of course). Coming out of a client meeting the other day, I found myself at the top of Victoria Street waiting for a cab, right in front of Westminster Abbey. As usual, it was taking ages to find one, so I stopped to take a picture using my phone (it’s not been often this summer you get a blue sky like that). At which point I realised that despite living in London for nearly fifteen years (it’ll be exactly fifteen this saturday), I’ve never actually been inside. Which is frankly rubbish. I’ve never been inside St Paul’s either. Or Southwark Cathedral. Which I suppose you might find unsurprising for an atheist. 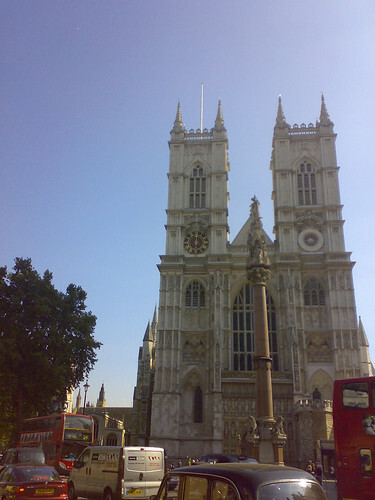 Except going to cathedrals is normally one of the first things I do in most European cities, so I’ve been a worst tourist in my home town than I am abroad (of course, being a good Catholic atheist, I’ve been to Westminster Cathedral several times, in fact it’s one of my favourite buildings in London). It’s not just cathedrals though. I’m rather embarrassed to admit I’ve never been to the National Gallery. This year I missed the (apparently brilliant) Psycho Buildings exhibition at the Hayward, and the Frank Gehry pavilion at the Serpentine (just like I’d missed Zaha Hadid’s last year, and all but one in previous years). Yes, I make it to most things at the Tate (and there is no way I’ll be missing the new Rothko exhibition, but still, I’ve been pretty useless at making the most of what London has to offer: each week Time Out lands in my letter box and despite reading and planning loads, most weeks I fail to make it to any of them. And yet again despite promising not to miss it, I yet again failed to see anything at last weekend’s Open House. It’s too late to make Open House before I go away (it’s only once a year), but with only six months left I seriously need to get out and see more before I go, not least to help keep me distracted as the big day approaches. As of today, I have six months left at work, and boy is it dragging. I find it hard enough in the run-up to a normal holiday – I tend to book them around three months ahead, and even that’s hard as the date approaches. I decided to take a year off back on Christmas day last year, so I’ve already had nine months of attention, and there’s still another six to go. Aside from the daydreaming (which makes concentrating in meetings a nightmare – I completely zoned out for about ten minutes in one today. Thank god no-one asked me a question in that time, I wouldn’t have had a clue what was going on), the lying is the hardest bit. On Friday I was called into a meeting room by my boss – two colleagues at the same level as me have recently left, and he wanted to check that I had no plans to leave, as they don’t want to lose me. So of course I pledged my undying loyalty and laughed at the suggestion I had any plans to leave. I don’t think he saw through me (although who knows, I’ve been typically indiscreet at work about checking my blog, so there’s always a chance they already know. If anyone from work is reading: hello! ), but I still felt pretty guilty afterwards. Still, it’s not too long now til I tell them – will probably be sometime in November when there’s four months to go, which should give them time to find a replacement. On the plus side, my annual payrise kicks in later this week, which will be a boost to the savings. There’s also a fair few travels to keep me distracted in the meantime too – the Algarve in October (long weekend mountain-biking), Krakow in November (my birthday), Norway in January (stag do), and possibly a ski trip in February as well. Meanwhile at home I have various bits of travel-writing to help me with my daydreams, and right now I’m watching the ever-enjoyable sight of Bruce Parry trying yet more herbal hallucinogens in the Amazon. Now that’s something to look forward to. (or perhaps not, considering quite how much he’s just started vomiting. Perhaps I’ll stick to the Cusqueña). After nine previous nine trips to Ibiza, I’ve settled into a nice routine – a few days by the pool in my usual hotel, a couple of trips to my favourite beach, dinner at some of the best restaurants on the island (Soleado by the waterfront in Figueretas, El Olivo up inside the city walls of Ibiza Town, the beautiful courtyard of La Brasa). Normally a day trip by ferry to Formentera, a visit to one or two of the big clubs (normally Amnesia & Pacha). 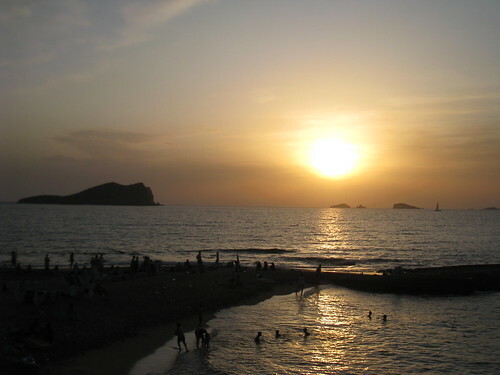 I’m not normally the sort of person who goes to the same place again and again – there’s too much of the world to see for that – but Ibiza is different. It’s probably my favourite place in the world – I can’t think of anywhere else that can combine some of the world’s best partying and dining with completely unspoilt, stunning beaches and the beautiful landscape of pine-covered rolling hills. It’s the perfect holiday destination. After my latest trip though, it’ll never be quite the same again. One of the perks of my job is the odd bit of corporate entertainment – normally lunch in some of London’s best restaurants, but occasionally the odd jolly abroad (and I do mean occasionally – I’m a crap blagger so this was only my second trip in ten years. My old boss used to manage about three a year). So when I was invited out there this year I leapt at the chance, and boy was it worth it. For a start – no cheap hotel this time. Oh no. Instead, I got to stay in an enormous villa with a huge pool. I’ve kind avoided the villa thing before because I couldn’t be arsed cooking for myself. The organisers kindly got round the problem by arranging a chef for us. Hard life eh? And she was amazing. She even had me wolfing down the salads she made, and I *hate* salad. When it came to eating out, I thought I’d eaten well on the island in the past. This time, I got to eat in probably the poshest restaurant on the island, L’Elephant. 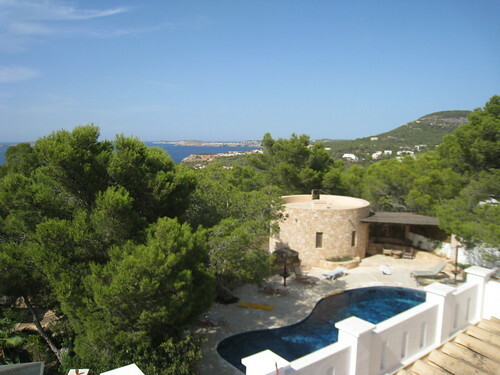 By day, we spent too days at different private beach clubs in gorgeous little coves. On the Thursday, we sailed out to Formentera on a catamaran, before having lunch at the best seafood restaurant on that island, Juan y Andrea. As for clubbing, well, we still went to my usual haunts, but this time we had tables in the VIP areas. In Amnesia, that meant being on a balcony well away from the shellsuit-clad masses, and drinking vodka at the ridiculous price of €400 a bottle (that’s certainly one way of making sure regular people can’t afford to do the VIP thing). That was particularly bizarre – the table next to us was populated by a couple of short, fat, balding millionaires from Russia, accompanied by 5 hookers they’d shipped over from Moscow. It started out quite amusing, but as they leered at them and groped them it got a bit unpleasant.You just can’t buy class. The VIP experience in Pacha was much nicer – it’s the most beautiful club in the world as it is, but having a table overlooking the dancefloor and DJ booth was even better, especially with David Morales, one of my favourite all-time DJs playing. 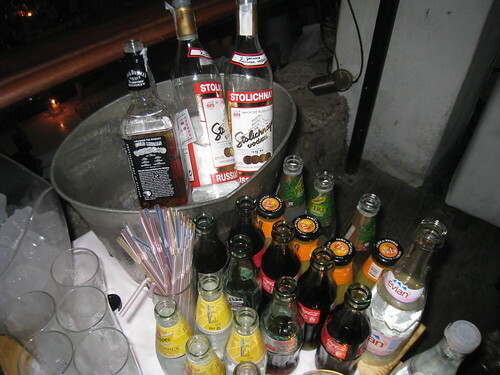 The drinks were equally expensive there – not that I got to enjoy too many of them as I ended up falling asleep at 5am. I’m not as young as I used to be, sadly. Inevitably there had to be a comedown – and of course, that was provided by Easyjet on the way home. With no full-service airlines flying direct from London, even VIPs have to slum it sometime, and we ended up delayed by two hours taking off, diverted from Stansted to Luton as the runway had shut, and then held for a further two hours after landing before they took our luggage off the plane. Three hours sleep later and I was back at work. I suppose it was inevitable really. Only a few days after hitting a new peak of excitement, finally the nerves have begun to kick in. I’ve only got 6 weeks’ backpacking experience under my belt, and only 4 of those were solo, and it suddenly hit me that I’ll be on my own for a whole year. I know thousands of people do it every year, but the last few days I’ve become a bit neurotic thinking about all the bad things that could happen. What if I get kidnapped in Colombia? Get robbed somewhere remote and end up stranded with no cash and no passport? Have my bag nicked from off the top of a chicken bus? Swept out to sea while diving? Bitten by a dog well away from the nearest doctor and get rabies? Break my ankle by being a little bit over-enthusiastic up in the Andes? It’s not just the big dramatic things, I worry about more mundane but equally stressful things – what if I find it hard to meet people and get lonely? What if I find it hard to adjust to a $50 a day budget when I’ve been used to spending way more that in London, and my money runs out too quickly? What if I get homesick? I suppose it’s only human to worry, and the rational bit of my brain knows it’ll be OK (and it’s probably healthy to have a few nerves, so I’m more aware of potentially risky situations) but it’s still a bit of a comedown after all the giddy excitement of the last eight months. After several months of procrastinating (it’s my greatest talent), I’ve finally got round to sorting my itinerary for next year, because I need to book my ticket quite soon – mainly because availability for the Santiago-Auckland leg on RTW tickets is extremely limited, so I want to do it as soon as they go on sale. I’ll be setting off from London on 30th March 2009, spending the first 6 months in Latin America, before heading for a couple of brief stops in New Zealand and Australia and then heading to SE Asia for the last 6 months. Almost all of the flights are in that first 6 months, as once I arrive in Indonesia I don’t want to have anything preplanned for the last half of my trip. Contrary to my normal instinct to plan my holidays to death (if only I could be that organised in any other area of my life), I want to just travel around and see where I end up, only knowing I have to make it back to Bangkok at some point to head home. All of these (except the Santiago – Auckland) leg should be flexible, so who knows how much this might change once I head off. Even so, having firmed up the plan is one more step in building the excitement. Next step: book the ticket and then think about all the other things I need to think about before I head off.